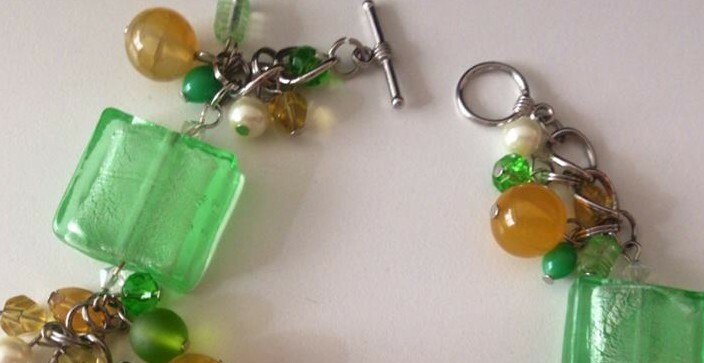 Do you bead or make jewelry? Today, I received my subscription box from Blueberry Cove Beads. For me, this is a fun way to get and try things that I might not normally gravitate towards when it comes to buying jewelry supplies. Each month comes with a theme, and a chance to participate in a challenge to win your next month free. This month’s box theme is Victorian Gothic…perfect for October. I’m loving the bit of lace for a choker, and also the other center accent pieces as well. I can also envision something with the faceted crystal beads, especially the deep purple ones! Stay tuned for that upcoming project. 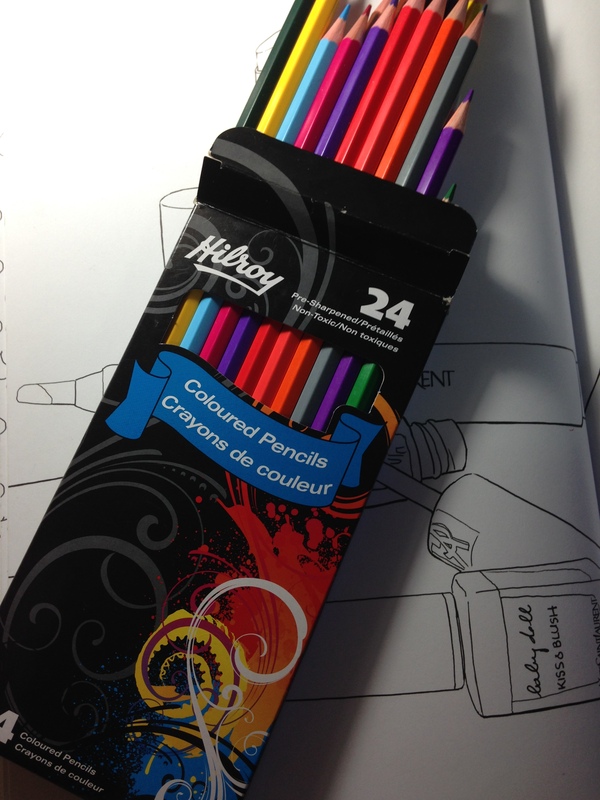 Today the mini review is for the 24-pack of Hilroy coloured pencils that I purchased at Staples. Visually, these pencils are quite pretty with their bright colours and the points are sharp and hold a good point. I really tried to like these pencils, but I couldn’t even finish my test picture that I was colouring. I was less than impressed with their performance. 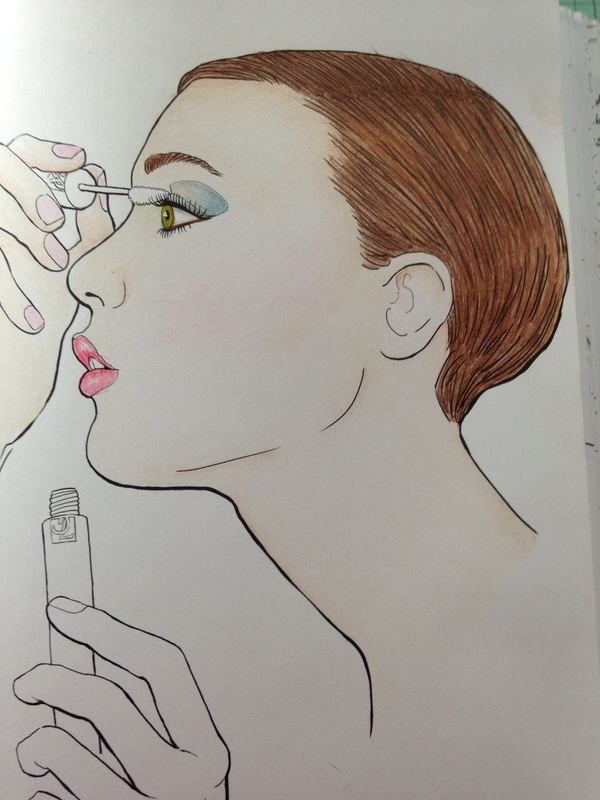 Image: My Makeup Coloriages coloured with Hilroy coloured pencils. These pencils are hit and miss with their pigmentation; the lighter shades are so sheer and lay down more wax than colour, and I could not get them to build enough variation for shading. Yes, I still believe that any pencil can produce a beautiful result, however I did not enjoy the way these pencils performed. These were the same price as the Staples, branded Staedtlers,($5 CAD) that I reviewed on day one, however I would not purchase these again. Prismacolor, has gained incredible popularity in this new colouring trend. They make several types of pencils, but today’s focus is on their student-grade, Scholar, pencils and their artist-grade, Premier, pencils. There seems to be a general consensus that if it’s student-grade it’s inferior, so we must have the artist-grade. When it comes to fine art manufacturers creating each of the two grades, often there is in reality, only a very small margin of difference. Did you know that? Most notably, the difference will be in the quality of pigments used; the student-grade pencils will usually be made with synthetic pigments that have no lightfast properties, which of course makes them less expensive and more in line with a student’s budget. Artist-grade pencils will usually contain fine mineral pigments with lightfast properties, allowing the works of art being created to withstand exposure to light without fading, after all they will have to withstand many years of being on display. One is not necessarily inferior or superior, it’s better to think of them as being different. In comparing the Scholars and Premier pencils, one can see both perform quite well and closely to the other. So, where else are we going to see a difference between the Scholars and Premiers? 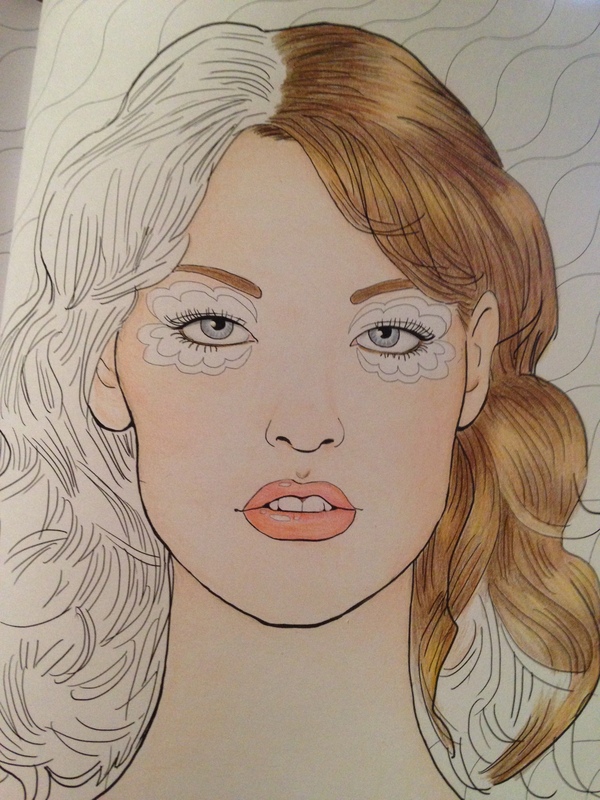 Image from My Makeup Coloriages. Can you tell which is coloured with Scholars and which is coloured wth Premiers? The range of the size of the sets available. The Scholar’s largest set comes in 60 pencils, while the Premier’s largest set comes in 150 pencils. The largest Scholar set, is designed to teach colour theory, and creating colours through blending. Do not be fooled into thinking that it isn’t a complete enough set to meet most colouring needs. The largest Premier set, has a fuller range of colours, to create more subtle and complex shadings and blendings…have you seriously seen how many different greys and neutrals are in that box of 150? Along with the difference of pigments used, is the difference in waxes, the Scholars have less, resulting in a slightly (ever so slightly) firmer lead, which will hold a point longer when sharpened, and less breakage. The Premiers are very soft, and and very waxy, and don’t hold a point for quite as long. However, most artists will manipulate their strokes, and rotate the pencil as they work, helping to shape and maintain a point as they go. Lastly, one of the biggest differences is of course cost. Cheaper does not always mean inferior, especially in this instance. I paid just under $20 for my full set of Scholars, while my full set of Premiers was approximately $130. Phew, that was a lot of information to cover – are you still with me? 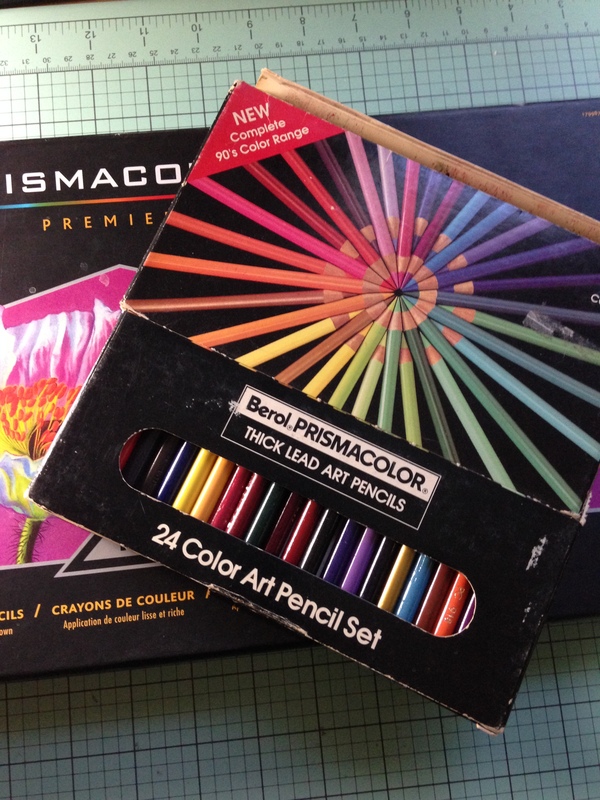 Full disclosure here: I’ve been using Prismacolor pencils now for over 30 years now; they were what I first used in art school, oh so many years ago. I can remember buying them first, a few at a time, then being delighted when I had enough funds for my first set of 48! I wonder how many boxes of Premiers I’ve used up over the years. Let’s start with the Scholar pencils. I think this has to be one of my most favourite sets of student-grade pencils that I’ve ever used. 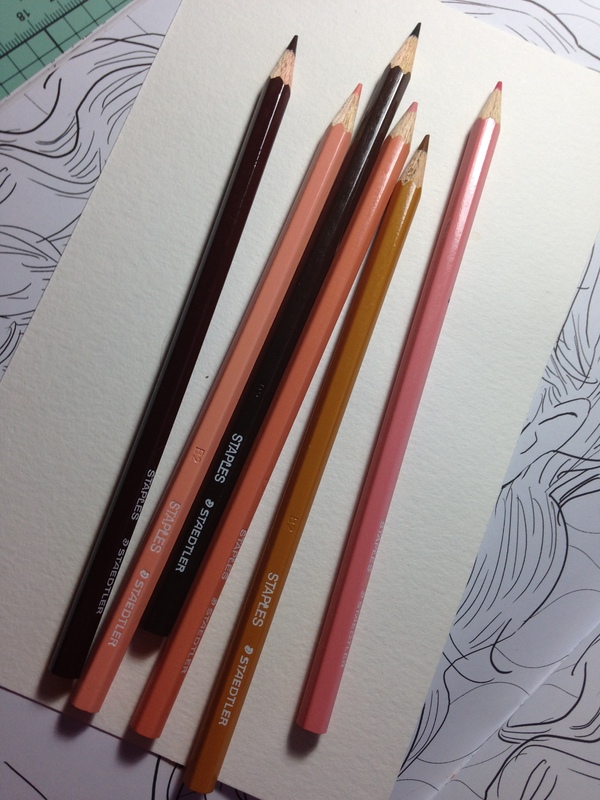 As discussed above, these pencils are highly pigmented, the colour is somewhat opaque and the laydown is creamy over the paper. These pencils will layer and build beautifully, and blending is a dream with these. As these are less waxy than the Premiers, you will notice that you do not have the same level of waxy sheen that comes with layering and building up your colours. The Premiers, like the Scholars, are also highly pigmented, slightly opaque colour laydown, they glide smoothly over the paper, layer beatifully, building to rich and vibrant tones, and blend beautifully for shading. As these are quite waxy, however you will notice that as you continue to build your layers of colour, your artwork becomes shiny with the wax, which can lead to something called waxy bloom, where that shine from the wax casts a white-ish film over your artwork. This can be minimized by treating your work with a workable fixative that you spray on as you near completion of your artwork. Tomorrow’s mini review will be Hilroy pencils. Today’s mini review is Crayola coloured Pencils. For most of us a Crayola, product was our first experience in creativity. This brand has been around for over 100 years, and is still going strong and broadening their range of creative mediums. They started with crayons, and now produce pencils, markers, modeling clay, paints, etc. There is no reason that these first loves should be relegated to only being for children, they are great for all ages and skill levels. 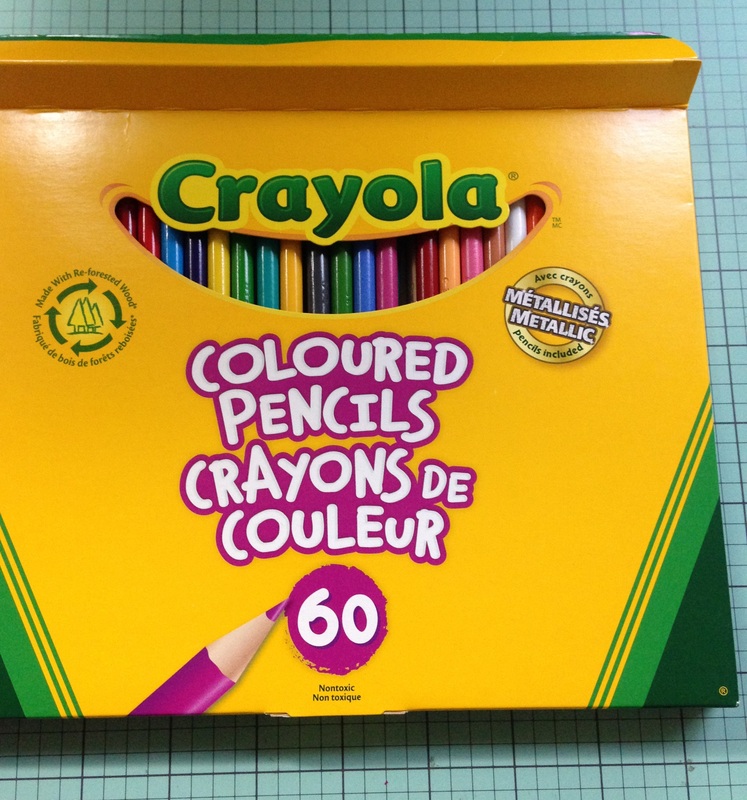 I absolutely love that this 60- pack has a very full range of colours, including metallic. It is a complete enough set to allow for all sorts of shading and blending. The pigmentation is bold and they laydown on the paper is quite smooth, although I think the Staples Staedtlers, might be slightly smoother. I found them to blend quite well, with a little bit of working of the pencils. As for the pencils themselves, they are a smooth rounded shape with a firmer lead, and I like that the colour names are on the body of the pencil. 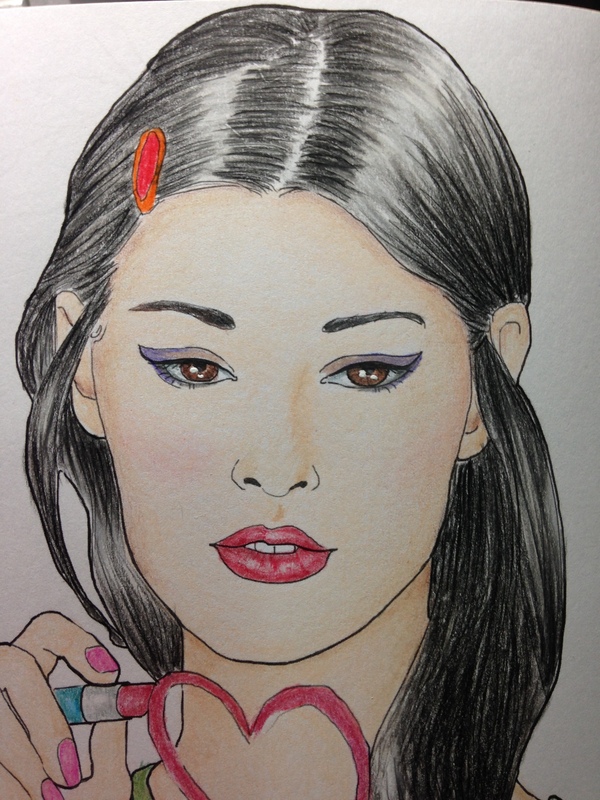 Image from My Makeup Coloriages coloured with Crayola coloured pencils. This brings me to what I didn’t enjoy about using these pencils; sharpening them. This was a ridiculous and frustrating task. My older pack from about 10 years ago sharpens beautifully, it’s the newer pack that drove me absolutely screaming mad. I’ve ended up with 4 pencils so far that are now about 4″ long and I’d only used them once. I think the problem is the wood that they are being manufactured with, it seems to catch on the blades of the hand sharpener and then becomes jagged and snaps the lead. I finally broke down and put them to the electric sharpener and had better results. These are the first coloured pencils that I’ve ever used an electric sharpener on. In my art school days I learned that was a basic no-no for artist grade pencils, plus, I’m sure my instructor really just wanted us to sharpen our pencils with our x-acto knives, and sanding block. At approximately $10 a pack these are also quite budget friendly, and are great for beginners, and just about anyone looking to have additional pencils in their colouring kit. I encourage you all to search YouTube for the “Crayola Challenge” and watch what some of the artists are producing using only Crayola coloured pencils or crayons. 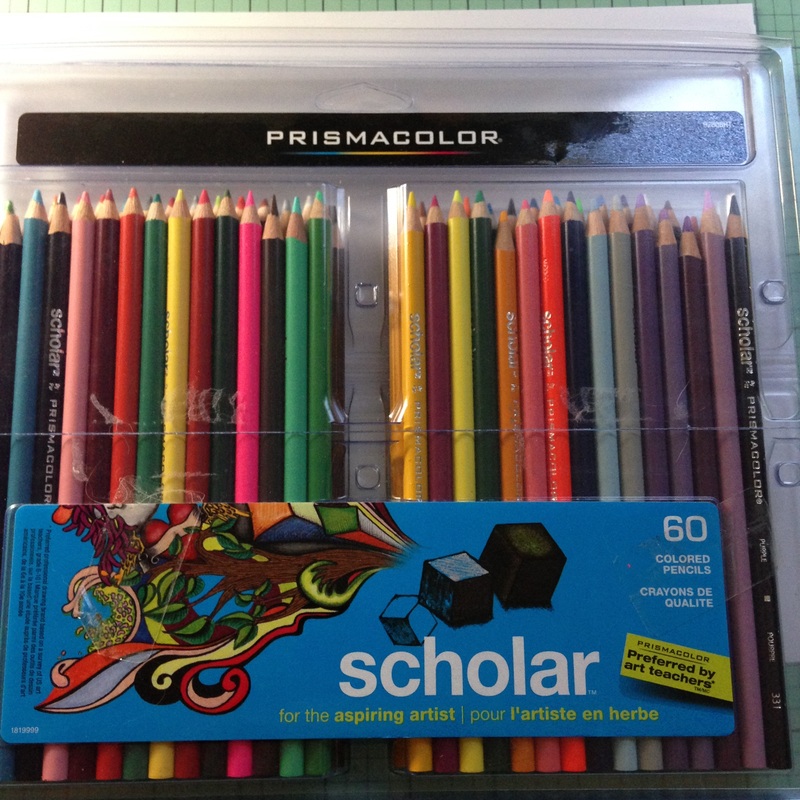 Coming up tomorrow a review/comparison of Prismacolor Scholar and Premier pencils. 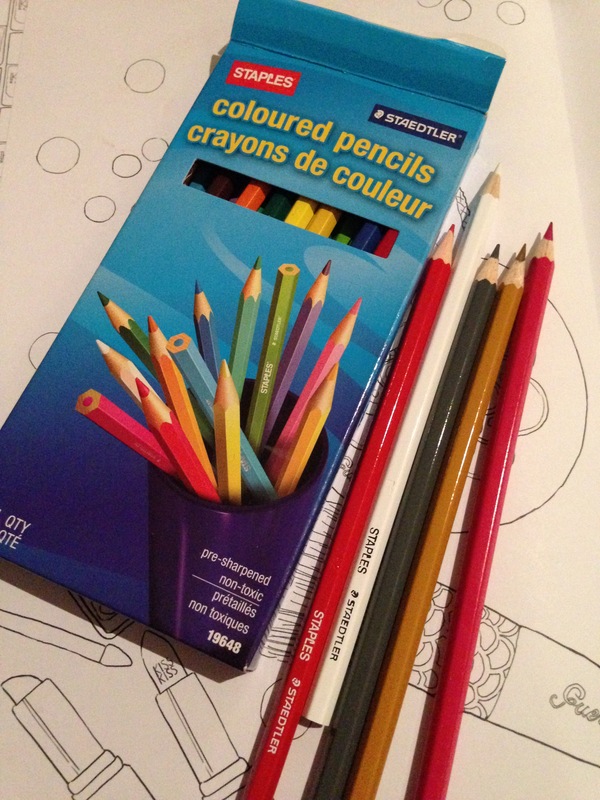 Today I’m all about coloured pencils…or pencil crayons if you’re in Canada. I am always seeing posts in the colouring groups asking, “What pencils should I buy”? Invariably the answer always seems to be Prismacolor Premiers, an artist grade pencil, complete with a higher price point than most colouring supplies. I am now also seeing posts from people who’ve bought these pencils and hate them, hate them more than likely because they didn’t really know or understand this particular medium. I strongly believe that any pencil can produce a beautiful result, and that the art is created in the skill of the artist. To that, my recommendation when asked what pencils to buy is this; buy to both your skill level and budget, learn your medium, master it, then advance, or branch out if you want to try something else. To illustrate my point, I’ve taken my current favourite colouring book, My Makeup Coloriages (Hachette Publishing) and several brands of coloured pencils and put them to the test. Each page so far has been coloured using either a set of student grade pencils or set of artist grade pencils. Please note. These are pencils that I have purchased on my own and the comparison/reviews are from my own experience. I’ve placed a link to the colouring book, where I purchased it and It is not an affiliate link. First up are the Staples branded, Staedtler, coloured pencils. After a bit of investigating I was only able to find them in the Canadian Staples stores, and the largest set available is the 24-packs. I was rather disappointed in that, as I had initially purchased the 48-pack at the beginning of the year. It’s quite a shame that the larger sets have been discontinued. I was pleased with how smoothly these pencils laid down over the paper, the colour pay off was quite good, and could be built up without difficulty, and they blended beautifully. I loved the range of tones in this pack, and the hexagonal shape for easier gripping and usage. I did not like the fact that there is no colour or number reference for these pencils, and as already mentioned, I didn’t like that the larger packs have been discontinued. All in all, at approximately $5 CAD, these are a good budget friendly pencil, and I have now purchased them twice. Please come back for tomorrow’s mini Crayola colour pencil review. Markers, Markers, and More Markers! Today I want to talk about markers, did you guess? It’s a good idea to know about the different types of markers, and how and why they work the way the do. There are three basic types to choose from: alcohol/solvent based ink, water based ink, and gel pens. 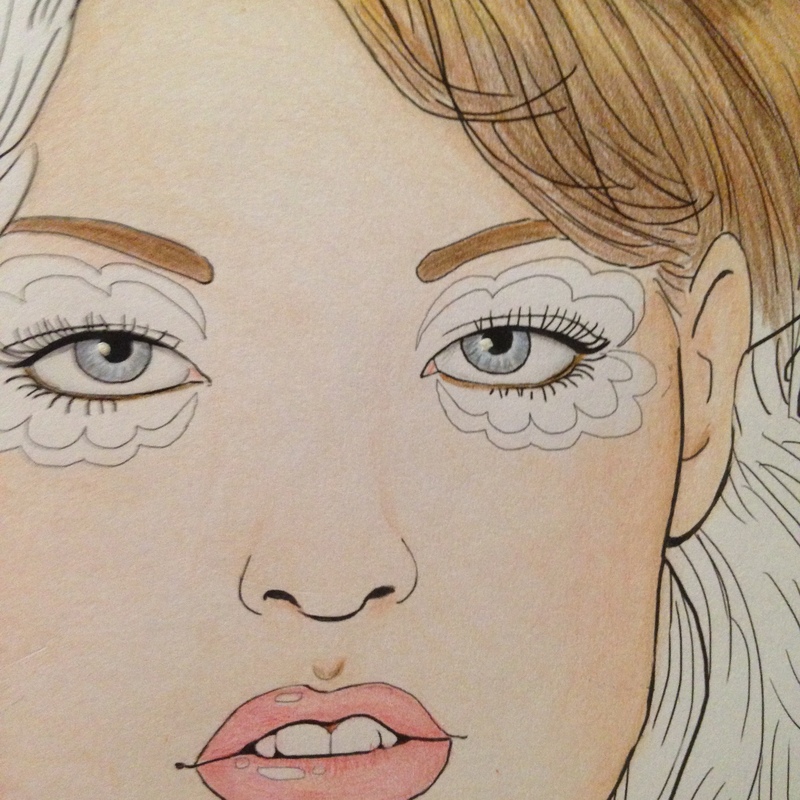 First, lets talk about alcohol markers, as they seem to be the preferred marker by most colourists. Names you might recognize in this category are, Sharpie, BIC Mark-its,(lower price point) Copics, and Prismacolor, (higher price artist grade) just to name a few. These markers will bleed! They are designed to…it’s a feature, though not one most people want to deal with. 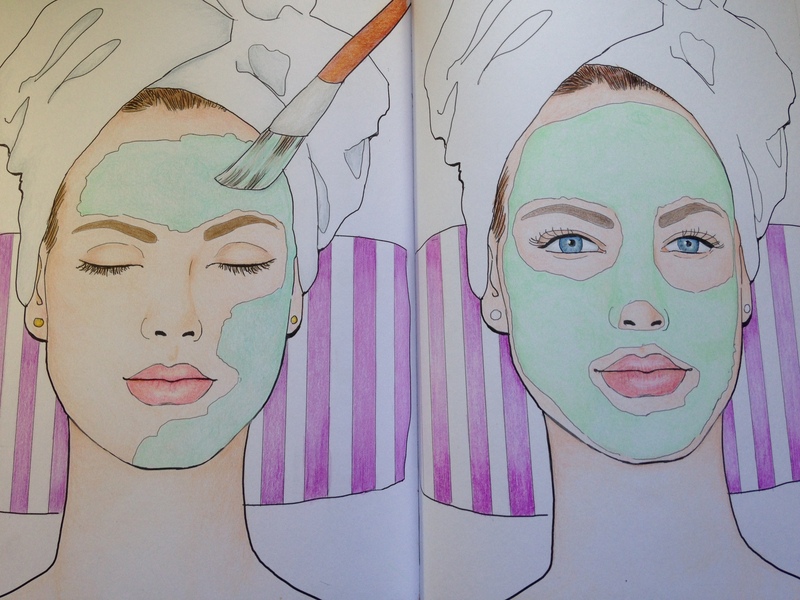 These markers are designed to blend and shade, to work in what is called a wet-on-wet technique, meaning that you add your next shade while the paper is still wet from the first shade and blend for optimum results. To accomplish this, they need to be able to make several passes over the paper without the paper disintegrating; think of the paper as a filter, made up of little wood fibers. Now imagine swiping a marker over it several times and the ink saturating the paper. The wood fibers do not absorb the alcohol/solvent, and pass through the filter flooding it with colour. The result is a very smooth wash of colour, with it having been carried through to the other side. My thoughts on why these are often the preferred marker is that it takes little to no skill to achieve a superb result. A word of caution, if you are sensitive to chemical smells, these markers may not be for you. Let’s move on to the water based ink markers. Here you can find such popular markers as the Tombow Brush Marker, Staedtler and Stabilo fineliners, Crayola SuperTips, and Faber-Castell PITT pens, again, just to name a few. The beauty of a water based ink marker is that there is very little, to no bleed through. Again, think of that filter of little wood fibers, in this case, the water that is in the ink is absorbed by those fibers, and too much will cause them to break down, and the paper to pill up and tear. There is a definite learning curve with these to achieve a filled in space without wrecking your paper, practice your strokes, slow and steady like a meditation, while moving the pen in small circles over the paper. In this category, a marker with a brush tip will lay down a smooth stream of colour pretty quickly. A helpful note here, try using what is called a hot-press paper, where the paper is compressed with steam in the manufacturing process, for better results. Lastly, there are the gel pens, they come in plain, metallic, glitter, and glaze finishes. These are another popular way to use a pen with your colouring, as there is generally no bleed through. Gel based inks are designed to sit on top of the paper, with no permeation. This means these pens will require a fair bit of time to thoroughly dry to avoid any smudging. As with any skill, the way to master it is to practice, practice, practice. I hope you’ve found this information useful and it helps you make your marker selection. Good Sunday morning. As I sit here enjoying my morning coffee and some music, I am pondering my day. I have neglected a few things around the house this week, and they’ve piled up, but thankfully, the dishwasher and laundry machines will tackle most of it with a minimum of interaction from me. Which leaves me free to finish colouring up a picture I’ve been working on and gather up some thoughts that have been rattling around my brain lately. Please forgive the photo quality, I’m still getting the hang of taking good pictures and have realized I need to get a tripod to help steady my images. Working on her hair, remembering highlights. Earlier this year, I joined a few Facebook groups for colouring and colouring books. To say it has become a passion is a bit of an understatement. It was a great way to reconnect with all of my art classes back in college, to use what I’d learnt and had not applied to any career path in my life. I pulled out my 30 year old box of art supplies, and lovingly walked down memory lane with all the different mediums..some I had since replaced, and so I donated things to others who had none. I see all sorts of things in these groups, I see beautiful artworks, which humble and inspire me, I see beautiful books, which fill me full of want, and I see people acquiring TONS of art supplies, usually without any knowledge of what they’ve purchased, nor how to properly use them. I see lots of frustration, and damning of supplies, when really what is needed is an understanding of what each medium is, how it works, and why it works the way it does. And the questions…so many questions, and answers, most of which are good sound advice, and some that are so ridiculous I just want to shake my head and scream. I’ve been debating whether or not I would do a basic write-up to address some of these as I come across them, (such as do all markers bleed?) and the answer is yes. Stay tuned…I will tackle the wherefores and whys of different types of mediums, and how they work. 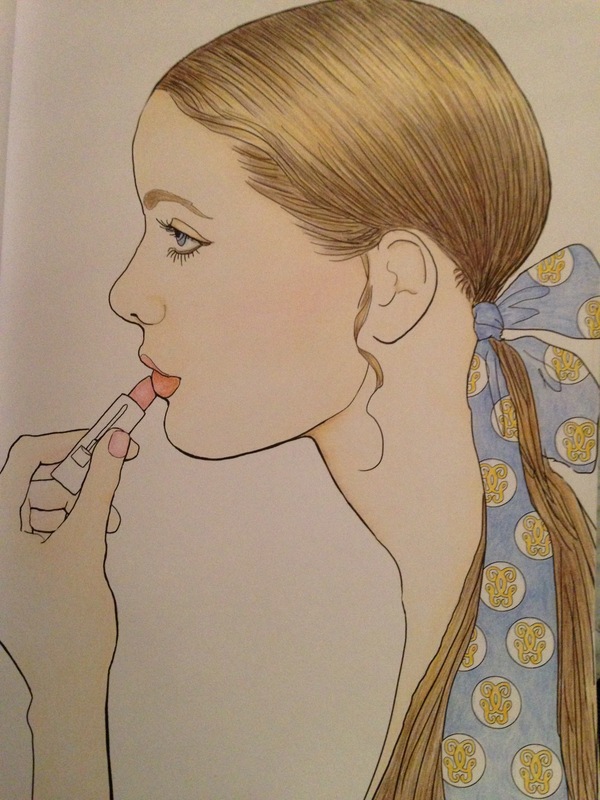 But for today, it’s finishing up my colouring, from the French colouring book: My Makeup Coloriages,using a $5 set of coloured pencils to show that it’s the skill and technique that create the art, not how expensive your pencils might be. I picked up a 48-pack of Staples branded Staedtler pencils on sale earlier this year, and have loved using them.